With the end of December it’s the time to see what was popular around here, and just how popular it was. I keep figuring I’ll learn something useful from these explorations. Now and then I come to conclusions and one of these months I’ll even act on them. December was an exhausting month. The last couple weeks of any A To Z sequence always are. These sequences are great fun, of course, or I wouldn’t keep doing them. But fatigue sets in, especially as I discover I’m not getting as far ahead of deadline as I imagined I would be and I get to the difficult letters of the alphabet’s end. And the Fall 2018 A To Z made up for being less frequent than past glossaries — two, rather than three, essays a week — with being crazily longer. So I was exhausted by that. And then the mathematically-themed comics for my Reading the Comics posts completely dried up. Add to that real-life obligations that I would not skip — being with family, and going to pinball events — and I ended up posting 17 things in December. Which is more than usual, yes. A typical month is 12 to 14 posts. But it’s down from the 23 of October and November, and I’m as convinced as I can be without evidence that the number of posts determines how many page views I get. So October 2018, aided in part by my hosting the Playful Mathematics Education Blog Carnival, had 2,010 page views from 1,063 unique visitors. November I got in 1,611 page views from 847 visitors. December, well, that saw 1,409 page views from 875 visitors. I’d have liked to have taken this screenshot at just past midnight, Universal Time, on the 1st of January, but I was busy with something or other. Who can really say what, or why, though? There were 82 things liked in December. It’s a slight drop from November’s 85, and October’s 94. I suppose it’s a rise in likes per page view, at least. The number of comments utterly collapsed, which probably reflects the end of the A To Z project. In October and November I had appeals for suggested topics; December didn’t have time for them. So what was 60 comments in October and 36 in November dropped to 17 for December. It’s not my least talkative period of the last year, but it’s up there. I need, seriously, to work on opening my posts to more comments. I’d ask people for suggestions how to do that, but who would answer? How Many Grooves Are On A Record’s Side? So my improved Buggles picture is paying off there. That was 68 different countries sending readers, down from November’s 70 and October’s 74. There were 17 single-reader countries, up from November’s 13 and down from October’s 23. The Palestinian Territories and Saudi Arabia were single-reader countries in November too. Colombia’s been a single-reader country five months now. I don’t see how China can be a single-reader country, even given that English isn’t a primary language there. More than one person has to stumble across here just by accident. There’s something going on there. According to Insights, I start the month and year with 72,915 total page views, from an admitted 36,260 unique visitors. I published something like 18,587 words here in December, which is a drop from the 26,644 of November. I write “something like” because I don’t know how WordPress tallies stuff like words in captions, and I don’t think it counts words in comments. And the idea of a “word” in a count like this is difficult to make precise and indisputable. So don’t be fooled by the digits into thinking there’s any precision there. Also it’s still 1,093 words per post, which is a bit down from the 1,158 in an average November essay but still. For the year-to-date, by the end of December, I was writing an average of 1,025 words per post. That is, posts for the whole of the year, rather than just in December. That’s down from the end-of-November average of 1,108 words per post. I averaged 5.2 likes per post, down from the end-of-November average of 5.3. And 2.8 comments per post, up from the end-of-November average of 2.7. That’s certainly not a significant change. I’m glad to have you as a reader, even if it’s just for this sort of self-preening post. You can put my posts in your RSS reader and enjoy them at your convenience. If you’re using WordPress regularly you can also add me to your WordPress Reader. That’s from the button at the upper-right corner of the page. On Twitter I’m @Nebusj. And just about every Sunday plus, usually, some other day of the week I’ll be Reading the Comics for the mathematics stuff. Thanks for being here. I expected there to be a fair number of readers here in October. The A to Z project, particularly, implied that. A To Z months are exhausting, but they give me a lot of posts. And I’m as sure as I can be without actually checking that the number of posts is the biggest determining factor in how many readers I attract. There were 23 posts in October, compared to September’s 15 and my summertime usual of 12 to 14. I’m so looking forward to seeing how big my faceplant back to normal is for November. No, really, nobody put references to me on some high-volume blog that tells people of cool stuff they might be reading. I couldn’t bear it. So this was my highest-readership month since the blog started seven years ago. 2,010 page views, from 1,063 unique visitors. That’s also the greatest number of unique visitors I’ve had in one month, and the first time I’ve broken a thousand visitors. September had 1,505 page views from 874 unique visitors; August, 1,421 page views from 913 unique visitors. There was a bit of an upswing in the number of likes: 94 of them issued in October, compared to September’s 65 and August’s 57. This is on the higher side for this year, but it is down a good bit from the comparable month two or three years ago. In June 2015, for my first A to Z, I drew over 500 likes; I don’t know where likers have gone. There were 60 comments on the blog in October, partly people who liked or wanted to talk about A To Z topics, partly people suggesting others. It’s the greatest number of comments I’ve had in one month in two years now. September had 36 commenters; August, 27. Have to go back to March 2016 to find a month when more people said anything around here. That, too, was an A-to-Z month, and one of the handful of months when I posted something every single day. 52 countries sent me any readers in August. 58 did so in September. There were 16 single-reader countries in August and 14 in September. For busy October? 74 countries sending me any readers at all. 23 countries sent me a single reader for the month. Czech republic has sent me a single reader two months in a row now; Columbia, three months in a row. Insights tells me that I started November with a total of 69,895 page views, from a logged 34,538 unique visitors. As ever, please recall the first couple years WordPress didn’t tell us anything about the unique visitor count, so for all I know there “should” be more. In October I published 28,733 words, which is nearly double September’s total. Whew. I’d posted 142 things this year by the start of November, and gathered a total of 391 comments and 787 likes for the year to date. This averaged to 3.1 comments per post on average, up from 2.6 at the start of October. And 5.5 likes per posting, down from 5.8 at the start of October. The 142 posts through the start of November averaged 996 words each. That’s up from 946 words per post at the start of October. I’m going to crush myself beneath a pile of words that I meant to be less deep. If you’d like to add this blog to your WordPress Reader, there should be a button to do so at the upper right corner of this page. It should also be an option in this pop-up menu from the lower right corner. Or you can add this blog to your RSS reader, and read it in any format you like and without me or WordPress being able to track you. If you’d like to follow me on Twitter, I am @Nebusj. Still thinking seriously about getting a Mathstodon account. And if you’re interested in my two biggest projects here, all of my Fall 2018 Mathematics A-To-Z should appear at this link. My biggest ongoing project is Reading the Comics, and its many posts are here. Thank you for reading. I like to do my monthly recap of my readership, like, at the start of the month. It’s just that between the Carnival, the A-to-Z, Reading the Comics, and my being busy on Friday I didn’t have the time before now. I’d say that it doesn’t matter because these statistics-review posts are mostly for my own entertainment. But I do feel there’s something untidy in my being a week late. Yes, I’m excited by what I see for October’s views already. I should have made this chart sooner in the month. Now I’m going to be all disappointed when it doesn’t stay this riotously popular on, like, the 28th of October. The number of ‘likes’ around here rose, to 65. Had been 57 in August and 37 in July. That’s still tiny, though, compared to what was normal around here even a year ago (98 in September 2017, and that was down from all of 2016). The number of comments was up, to 36 from August’s 27 and July’s 28. But the number of comments around here is so erratic that I’ve mostly given up on figuring any kind of pattern. I have the suspicion that the Playful Mathematics Education Blog Carnival #121 post will be most popular next month too. And that only my publishing it the last day of September kept it from being on top for that month too. 52 countries sent me any readers at all in August. 16 of them were single-reader countries. The same numbers accurately described countries and single-reader countries for July. And for September? … Here’s the roster. So that’s 58 countries total, with only 14 of them single-readers. Argentina, Chile, and Colombia were single-reader countries in August; nobody else was. No countries are on a longer than two-month streak. I don’t think I’ve ever seen more than a hundred readers from the Philippines. Also 12 readers listed as from the European Union, distinct from the countries participating in it, seems unusually many. According to the Insights panel I’d had 119 posts this year, right before October began. And had gathered 67,885 page views. This would be from a total of 33,475 acknowledged unique visitors. (My blog started before WordPress told us anything about unique visitors.) As of the start of October, there had been 313 total comments. This makes an average of 2.6 comments per post on average. At the start of August there had been 2.6 comments per post on average. But remember that was fifteen fewer posts. At the end of September I’d gotten 696 total likes, for an average of 5.8 likes per post. That’s down from 6.0 at the end of August. By the end of September I’d had a total of 112,648 words posted around here. 15,014 of them were posted in September. Since there were fifteen posts altogether that’s an average of 1000.1 words per post in September. For the year, through the end of September, that’s 946.6 words per post this year. At the end of August that had been 930 words per post. So as ever, my attempts to write more quick, simple, short things that don’t wear me out has failed. And I have the rest of an A to Z to write, too! I’m so doomed. If you’d like to watch my continuing logorrheic doom, please follow along. You can add me to your WordPress Reader by using the button at the upper right corner of the page. If you’d rather read without my having the ability to track, you can follow me by RSS here. If you’d like to follow me on Twitter, try adding me as @Nebusj. Thanks for being here, in whatever form you are. I’m hoping to get my 2018 Mathematics A To Z started the last week of September, which among other things will let me end it in 2018 if I haven’t been counting wrong. We’ll see. If you’ve got requests for the first several letters in the alphabet, there’s still open slots. I’ll be opening up the next quarter of the alphabet soon, too. And also set for the last week of September — boy, I’m glad I am not going to have any doubts or regrets about how I’m scheduling my time for two weeks hence — is the Playful Mathematic Education Carnival. This project, overseen by Denise Gaskins, tries to bring a bundle of fun stuff about mathematics to different blogs. Iva Sallay’s turn, the end of August, is up here. Have you spotted something mathematical that’s made you smile? Please let me know. I’d love to share it with the world. I’m a little surprised to have had fourteen posts. I was pulled away from my writing the last week of the month so thought I would just have a gap. Huh. August was a busy month, with 1,421 recorded page views. The last several months had been 1,058 and 1,077. This is the third-highest number of page views since April of 2016 at least. And that’s from 913 unique visitors, which is the second-highest number of unique visitors I’ve got on record. (March 2018 continues to taunt me with 999 unique visitors.) People found something they liked. They liked 57 things, which compares to July’s 37 by being larger. It’s still an anemic total, though. June had 94 likes, and even that is way down from a year ago. August 2017 had 147 likes. And there was a time there’d be 345 likes in a month. That time was April 2016. Comments drifted slightly downward, to 27 from July’s 28 or June’s 30. I count that as holding still, anyway. As ever, I need to do better writing things that encourage responses. I’m still taking nominations for the A-To-Z, by the way, and shall be for a while yet. Also, discussions of fun mathematics which don’t fit the A-To-Z format may yet belong in the Mathematics Blog Carnival, to appear here at the end of September. Please let me know of anything that’s educational or playful or just fun that you’d like to see shared with more people. Can be your own writing; can be something you think more people should know. What countries of the world, plus the European Union, sent me readers in August? And how many? Here’s the official roster as WordPress make it out. They list 52 countries sending me any readers. This is the same as in July. There were 16 single-reader countries, again the same as in July. I know, I’m worried I made a mistake with the data too. Ah, but here. Austria, Ireland, and Romania are on two-month streaks as single-reader countries. Nobody’s been on the roster more than two months in a row. Serbia just missed the half-year milestone. The Insights panel would have me believe I started September on 66,380 page views, from 32,601 recorded unique visitors. I’ll go along with that gag. For the year to date, I’ve posted — well, I forgot to take a snapshot of the data before Sunday’s Reading the Comics post published. If we pretend the 2nd of September was part of August, though, then: I’ve had 105 posts so far this year; 14 in August and 15 in the Greater August that included this past Sunday. I’ve accumulated 269 total comments, for an average of 2.6 comments per post. This is the same average I had at the start of August. I gathered a total of 633 likes, for an average of 6.0 likes per post this year. Start of August I’d had 6.4 likes per post. Counting Sunday’s post I had 97,634 total words published so far this year, 14,551 of them in August. In July I had 14,032 words in only twelve posts. My words-per-post average is up to 930. Start of August it had drifted down to 885.3. If you’d like to read my posts you’ve got options. They all involve reading, though. Maybe having them read to you. But all my posts are available by RSS feed. If you like the WordPress reader, there’s a button at the upper-right corner of the page. And if you’d like to see messages announced on Twitter, I’m @Nebusj there. And yes, I am sniffing around Mathstodon.xyz, the mathematics-themed instance of the Twitter-like social site Mastodon. Just browsing its public feed can be fun. There’s a mix of people sharing neat stuff they ran across, little puzzles that’ve been bothering them, and legitimate current research. I do not have an account there and might not make one at all. But I’m thinking about whether I ought. Will tell you if and when I do. July 2018 was another month in which stuff got in the way of my plans. I know it seems like I’m always apologizing for that. But I tell you truly: stuff keeps getting in the way of my plans. I could keep up the most essential stuff, the Reading the Comics posts. But bigger projects — I may as well stop being coy; I’m hoping to do another A to Z this year — kept getting lost under daily stuff. This includes pet health problems. I’ll leave it at that because they were sad ones. But let’s see what these strained circumstances did for my readership, such as it was. 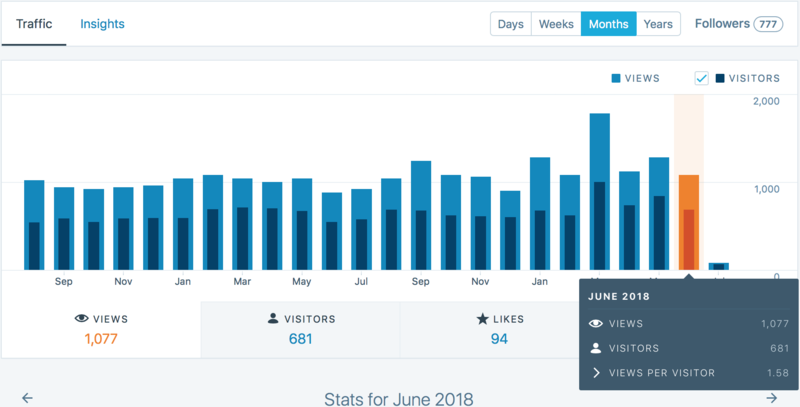 My WordPress.com statistics report for July 2018 and the months leading up to that. OK. Spent another month at above a thousand page views, which is a nice threshold. There were 1,058 pages looked at around here in July, down from June’s 1,077 and May’s 1,274. This is three months in a row I’ve had twelve posts, most of them Reading the Comics stuff. This goes to support the hypothesis that the thing most in my control that affects my readership is the number of things I write. There were 668 unique visitors, down a little from June’s 681 and a fair bit from May’s 837. The number of likes plummeted once again, to a mere 37. It had been 94 in June and 73 in May. But that’s still a drop. And it hurts a bit. I think I’m doing much better Reading the Comics posts than I used to. I credit the discovery that GoComics.com links aren’t as secure as I had thought. If I’m going to include the image of every comic strip I talk about, I want to have a more substantive discussion. Reprinting strips that I don’t have the copyright to is fair use, of course, in that I’m using them for educational purpose. But making sure that I have a deeper discussion based on the strip makes me feel more secure in my use. There were a large number of views of the record-grooves post. But they weren’t particularly concentrated any one day or week. I think it might have reached that point where it’s Google-ranked highly enough to turn up as an answer to people’s query. I’m always embarrassed when my self-examination posts are among the most popular stuff I write. But if I view them as concentrating the stuff my readers think is particularly important, well, that’s all right then. Maybe I should do more regular recaps of what’s been popular lately. Could fill that late-in-the-week content hole. But the important thing is I’m delighted people are reading about my prosthaphaeretic rule for finding square roots. I’m sure that it’s an old trick. And it’s not at all practical, not anymore. But I did notice it sitting there, waiting for me to uncover. That was fun. Now to the list of countries sending me readers: will it include the United States up top? There were 52 countries sending me readers in July, down from 55 in June and 58 in May. There were 16 single-reader countries, down from 19 in June and 22 in May. Slovakia’s been on that list two months in a row. Brunei and South Korea three months now. Serbia’s on its fifth month in a row on the single-reader list. I hope they like me a little bit enough. It’s a rare month to have no countries with an & in their name, like Trinidad & Tobago. Hm. If the Insights panel is correct, I started August viewed 64,958 times by 31,688 logged unique visitors. I’d finished with 90 posts on the year, gathering a total of 232 comments and 572 likes. That’s an average of 2.6 comments and 6.4 likes per post. I reached 83,083 total words published, an average of 923.1 words per post. At the end of June I was averaging 885.3 words per post. I don’t know how I got so much more longwinded so fast. But it does credit me with 14,032 words published in July, and that over only twelve posts. No wonder I’m tired. Thanks as ever for reading my posts. You can add this page to your RSS reader by using this address. If you’d rather add it to your WordPress reader, you can use the button at the upper-right corner of the page. And if you’d rather see me on Twitter, please do add me @Nebusj. Thank you. I’ve broken the habit of watching my WordPress readership statistics day-to-day. This is good. It’s too easy to read random fluctuations as significant changes. And to go from that to supposing that everyone’s decided they hate me now. I do still check monthly. And I try to think what I can learn from that data. Not too hard, and not enough to change what I do. But to where I might think I learned something. Meanwhile in the world’s dullest domino chain. So for the sixth month running I beat a thousand page views. Came in at 1,077. It’s my thinnest margin since back in February when there were a mere 1,062 page views. Still, I had a more than this large comfortable round number of page views. The number of unique visitors dropped also, to 681. That’s my lowest number of visitors since February again. But that just seems to reflect there being less traffic overall in June; the number of views per visitor was 1.58, basically the same as May’s 1.52 and April’s 1.53. No archive-divers here, seems. There were 94 things liked in June; that’s up from April’s and May’s 73, and down from March’s 142. There were 30 comments posted in June, up from May’s 17 and April’s 13, but down from March’s 53. All respectable enough; none exactly suggesting I know how to write stuff people love to share or comment on. Which is on me, of course; no reader’s got the job of responding to stuff they don’t care to. So I’m surprised that last month’s readership review post would be among the most popular. I guess it shows the value of having any picture at all, however marginally interesting, in a post. Still seems dangerously self-absorbed. The non-Euclidean geometry one also surprises me, since it was only up for two days and still got as many readers as anything else posted in June. The lesson here, I suppose, is that people love seeing me not know stuff that’s obvious to people familiar with a topic. This is promising for future essays, though, since there are so many obvious things I don’t know. There were 55 countries sending me any readers, down from 58 for three months in a row. There were 19 single-reader countries, down from 22 in May, up from 14 in April. Brunei and South Korea were single-reader countries two months in a row. Serbia’s had a single reader for me four months in a row now. The Insights panel tells me July started with this blog having had 63,897 total page views, from an admitted 31,020 unique visitors. It logs for the year 2018 a total of 78 posts that attracted, to that point, 196 comments. And that there had been 535 total likes given to something over the year so far. This comes to an average of 2.5 comments per post, and 6.8 likes per posting. By the end of May I had gotten only 2.4 comments and 6.7 likes per post, so, at least I’ve got something figured out. By the end of June I had posted 69,051 words as WordPress logs things; that’s 13,374 words over June, a bit more than I posted over May despite June being the shorter month. I’m up to an average of 885.3 words per post; at the end of May I was at a mere 843.6 words per post. The trend is obvious; by the end of the year I’ll just never stop writing things. You’ll just see a continuous feed of me putting more heaps of words onto this pile. You’ll be shocked how many times and how many different ways I can type ‘that’ wrong and correct it. Or how often an ‘of course’ creeps into my writing and I have to edit that out. As ever, I encourage you to read this post and more like it. You can add this page to your WordPress reader by using the button at the upper-right corner of this page. This link is the RSS feed, which gets all my posts as they’re posted, and which you can add to your RSS reader without my ever knowing about. I’m @Nebusj on Twitter. If you see me on Tumblr you’ve found a hoax, since I’m not on Tumblr and every time I look at it I feel helpless and confused. And now the easiest post I write all month: my review of what my readership looked like the past 31 days. I have to admit once more I’m not satisfied with my writership. I didn’t get some projects going that I wanted; but that’s all right. I’ve got five big ideas in mind for the coming several months. Thinking up what to do is always the hard part, other than actually doing it. So that’s my part. Now on to your, the readers’, part. Here I pause while savoring my last moments of not knowing the response was bad. Oh, how about that. It wasn’t bad. It was even good. Readership was back up in May, rising to 1,274 page views all told. This ties with January for the second-greatest number of readers so far this year. It’s a fair bit up from April’s 1,117. Down from March’s 1,779, but what wouldn’t be? The number of unique visitors rose too, to 837. That’s below March’s tantalizing 999, but up from April’s 731. I did post 12 pieces in May, compared to 11 in April, and 16 in March. I suspect that the number of posts published is the only thing in my control that can influence readership numbers. Of course the real information is in the Views Per Visitor statistic, but I don’t know what it means. So it’s worth spending some time improving the graphics for my crushingly detailed examination of the area of trapezoids. Writing blogs always say use quality graphics for your articles and it turns out they’re so right. I struggle still with reader engagement, and I understand that. A lot of what I write is in improv terms hard to advance. I need to be better at writing open things that encourage response. There were a mere 17 comments in May, improved from April’s 13 but still not much at all, especially compared to March’s 53. Which still isn’t great but is something. There were 73 things liked in May, the same number as in April. And way down from March’s 142. That’s 58 countries which sent me readers over the month. That’s three months in a row the total’s been 58 countries so I assume WordPress is just making these numbers up and figures 58 looks about right. Not suspiciously few, not suspiciously many. We’ll see. There were 22 single-reader countries. That’s different at least; in April there were 14, and in March 15. Finland and Saint Kitts & Nevis were single-reader countries in April also. Serbia’s been single-reader for three months running now. The Insights panel tells me that for 2018 so far I’ve had 66 posts, and have accumulated a total of 443 likes and 161 comments. There’s 55,677 total words. This means I published 10,836 total words over the month, which is more than I did in April. I thought I was tired. My year’s average right now is 843.6 words per post; at the end of April that was 830.4. My posts for May alone averaged 903 words. The April posts averaged 772. I knew I was getting more verbose. There’s 2.4 comments and 6.7 likes on average for the post. At the end of April this was 3.5 comments and 6.9 likes per post. The month officially starts with 62,824 pages viewed from a tracked 30,339 unique visitors. I’ve officially got 759 WordPress visitors, who’re following through their Readers page. I’d be glad if you joined them: you can use the button at the upper-right corner of this page to follow via WordPress. You can also see me as @Nebusj on Twitter. And if you’d prefer you can follow the RSS feed for my posts. If you do that I get absolutely no information about what you read or how interesting you find it, and that’s fine by me. We ended up putting 38 goldfish back in the pond. The reader with long-term memory may remember we brought 52 in. The fish had a hard winter, one afflicted by water quality issues and feeding issues. We’re trying to recover emotionally, and to work out a plan for better fish care next winter. People were far less interested in the number of grooves on a record’s side this past month. That’s what I take away from the readership figures around here for April, as WordPress reports. There were, it appears, some 1,117 pages viewed in April, from 731 unique visitors. That’s well down from March’s 1,779 views and 999 visitors. But March was clearly an outlier; February saw 1,062 page views from 611 visitors. This is four months in a row with at least a thousand page views, so everything seems consistent. The number of likes fell to 73, down from 142. This seems like a lot of drop, but considering there were 102 likes in February and 112 in January … yeah, that’s a bit lower. Hm. Comments were down, too, with a mere 13 posted in April. There were 53 in March, 30 in February, those are much more engaged numbers. It’s my doing, I know; I had a month of mostly writing about comics and that’s fun, but it’s not much to discuss. What’s to say, “That wasn’t really a student making fun of the story problem!”? Nah. Also I’m abashed to realize I had only eleven posts in April; March had a healthier count of 16. Definitely more normal than the March 2018 figures. How Many Grooves Are On A Record’s Side? And while that number hasn’t changed any, I did finally get a better picture of that Buggles album to use as picture. Reading the Comics, April 25, 2018: Coronet Blue Edition which … really? It had like two days to attract readers. Are references to obscure one-season 60s dramas really that compelling? … I’m a Mystery Science Theater 3000 fan from way back, of course I know they are. Reading the Comics, April 11, 2018: Obscure Mathematical Terms Edition and okay, that makes more sense being on the top-five list. Someone Else’s Homework: A Solution and my friend’s had a couple more homework problems to bounce off me and I’ve liked them all. I’m just sensitive I might spoil some poor instructor’s plans if I talk about too many of them. Reading the Comics, April 14, 2018: Friday the 13th Edition? and that makes sense being up on the roster too. The Insights panel tells me I’ve gotten to 44,841 total words published this year so far, with 135 total comments and 370 total likes. So, 8,494 words over the month. I’m currently averaging 830.4 words per post, 3.5 comments per post, and 6.9 likes per post. Words and likes are slightly up from March; comments are down a bit. That’s 14 single-reader countries, down one from March and down two from February. Serbia was a single-reader country in March; nowhere else was. May starts with 61,549 pages viewed from 29,502 admitted unique visitors. I’d appreciate it if you did follow NebusResearch regularly. I haven’t restored the e-mail postings, although if I go another month or two without anything suspicious turning up in the comments I might try it. But you can follow on your WordPress Reader, by using the button at the upper right corner of the page. Here’s the RSS feed, if you’d rather read the way you like without WordPress being able to trace you. And if you don’t mind Twitter you can follow me as @Nebusj there. Watch as I give the tally of how many goldfish we’re getting back out to the backyard pond! Well, one thing I know to post this week is my review of what my readership was like in March. Let me go see what WordPress will tell me about that. Not at all sure what happened there but it looks like I might’ve just had my best month ever. WordPress tells me there were 1,779 page views in March, way up from February’s 1,062 and January’s 1,274. Also it tells me this came from what I’m sure is a record 999 unique visitors and now that’s going to drive me crazy for like ever. There were 611 unique visitors in February and 670 in January. I am not positive but think my previous records were in March 2016 (1,557 views) and April 2016 (757 visitors). That’s on 16 essays posted, up from the 13 in February and 14 in January. Is this self-indulgent? No; I’ve learned that people are much more interested in posts when there’s any picture, however unimportant, attached. This is self-serving, an important difference. Had 53 comments made around here in March, my best since the glory days of early 2016. February saw 30 and January 39 comments and oh I did my best to keep caught up, but it’s hard. There were 143 things liked over the month; that’s up from February’s 102 and January’s 112. Greatest number since August 2017 and my last round of A To Z work. Insights for the year tell me that (as of the 3rd of April, anyway) I’ve had 44 total posts, with 120 total comments and 301 total likes. There’s 36,347 words posted so far in the year, and an average of 826 words per post. I’m averaging 2.7 comments per post, and averaging 6.8 likes per post. This is dangerous stuff to consider: at the start of March I averaged 2.8 comments per post, but a mere 6.7 likes. In fairness, there’s some comments I need to respond to and just haven’t had the chance; Easter and a pinball event ate up a lot of time. That’s 58 countries, up from February’s 54. There’s 15 single-reader countries, down one from February. Israel’s keeps me from having a clean break in the single-reader country streak; there was just the one reader from there in February too. April starts with a logged 60,445 visits, from an admitted 28,781 unique visitors. If you’d like to follow NebusResearch regularly, please do. There’s a button at the upper-right of the page to add this to your WordPress Reader page. You can also follow me as @Nebusj on Twitter, where I routinely post announcements of new essays here and on my humor blog. (The humor blog normally posts between 7 and 9 pm Eastern Time; the mathematics blog, typically, between 1 and 3 pm Eastern Time.) If you’d rather use your RSS reader here’s the feed for that. If you’d like posts e-mailed to you as they’re made … I’m sorry, I can’t take signups for that just now. I noticed a weird and large number of signups from people, from addresses that were a bunch of random words followed by four digits and all from outlook.com. I don’t know what angle they’re working but that’s got to be some spammer nonsense going on. So that’s turned off for a while at least. If you’re one of the nearly four people who’ve taken out e-mail subscriptions hold on to those accounts! They’re sure to be worth something someday. It’s not necessary to bag them in mylar just yet, but feel free to do that if you think it’ll be fun. It was a less riotously popular month here in February than it was in January. I’d like to blame the shortness of February, but that isn’t it. I know. I’ve got statistics. The big one that I worry excessively over: total page views. 1,062 of them in February, down from January’s 1,274 but up from December 2017’s 899. And hey, anything above a thousand feels gratifying enough. The count of unique visitors dropped to 611. It had been at 670 in January, but then it was at 599 in December. I’m working on stuff that might affect this. We’ll see. I’d wondered if the readership drop might entirely represent February being such a short month. But WordPress’s insights page lets me know the average number of pages viewed per day. 41 in January (part of a three-way tie for third-highest, alongside September 2017 and November 2015). 38 in February. Still, not bad for a month that went by without a major overarching theme to pull people back in. It was still a pretty likable month: 102 things clicked on over the course of the month. Down from January’s 112, but still, well ahead of December’s 71. It’s still in the range of liked-essays that I haven’t seen since the last A To Z project. There were 30 comments, once more down from January’s total (39) but up from December’s (24). It seems obvious that all these three data points should track together, although I’ve never tested that and maybe I could have some fun rambling about curve-fitting with it. I’m kind of seriously thinking to take some time off this month and just improve the graphics of the Record Grooves and the Trapezoids articles. And I’m always tickled when what amounts to a self-reblog, like the buy-a-theorem post, comes out more popular than the original post it references. I’m also thinking about setting some day aside to just reblog something from my archives. What countries sent me readers? This bunch, says WordPress. That’s 54 countries altogether, if we don’t ask serious questions about the European Union and, for that matter, Hong Kong or Puerto Rico. There’d been 50 countries give or take in January, and 53 in December. There were 16 single-reader countries in February, up from the 14 in January and 15 in December. Ireland was a single-reader country in January too. Russia’s been a single-reader country two months running. And otherwise there’s been a turnover in single-readership countries. The Insights panel says March started with 58,654 page views here, from an admitted 27,772 unique viewers and aw, isn’t that sweet number? The insights panel is also threatening to ruin me as a person by giving me some new interesting year-to-date statistics. According to these, as of the 5th of March (I didn’t have the chance to check on the 1st, and I don’t know how to find a year-to-specified date) I’ve published 25,359 total words, at an average 845 words per post. 30 posts to date for the year. 207 total likes, 77 total comments. And an average of 2.6 comments and 6.9 likes per post. I just know I’m going to obsess on these, what with how they’re numbers that have decimal points. But this is way more interesting than tracking the most popular day and hour. If you’d like to be among my readers, congratulations: you’re doing it now. You can follow in your WordPress reader by using the ‘Follow nebusresearch in Reader’ button near the center-right of this page. Or you can get the less-adequately-copy-edited versions delivered in e-mail, using the “follow blog via e-mail” button just underneath that. I’m @Nebusj on Twitter, and I’m closing in on my 10,000th tweet! So this is your chance to be there as it happens. Probably not this month. I’m not that chatty. But sometime. And that is: I don’t feel threatened at all so nyah. Back to my usual self-preening. January 2018 was a successful month around here, in terms of people reading stuff I write. According to WordPress, there were some 1,274 pages viewed from 670 unique visitors. That’s the largest number of pages viewed since March and April 2016, when I had a particularly successful A To Z going. It’s the greatest number of unique visitors since September 2017 when I had a less successful but still pretty good A To Z going. The page views were well above December 2017’s 899, and November’s 1,052. The unique visitors were well above December’s 599 and November’s 604. I don’t have any real explanation for this. I suspect it’s spillover from my humor blog, which had its most popular month since the comic strip Apartment 3-G died a sad, slow, baffling death. Long story. I think my humor blog was popular because people don’t know what happened to the guy who writes Gasoline Alley . I don’t know either, but I tell people if I do find out anything I’ll tell them, and that’s almost as good as knowing something. Still, this popularity was accompanied by readers actually liking stuff. There were 112 pages liked in January, beating out the 71 in December and 70 in November by literally dozens of clicks. It’s the highest count since August of 2017 and summer’s A To Z sequence. There were more comments, too, 39 of them. December saw 24 and November 28 and, you see this coming, that’s the largest number of comments since summer 2017’s A To Z sequence. The popular articles for January were two of the ones I expected, one of the Reading the Comics posts, and then two surprises. What were they? These. There were 53 countries sending me readers in December and 56 in November so I guess I’m concentrating? There were 15 single-reader countries in December and 22 in November. Russia and Uruguay were single-reader countries in December; Mexico’s been a single-reader country for three months now. WordPress’s Insights panel says I started the month with 57,592 page views recorded, from 27,161 recorded unique visitors. It also shares with me the interesting statistics that, as I write this and before I post it, I’ve written 16 total posts this year, which have drawn an average two comments and seven likes per post. There’ve been 900 words per post, on average. Overall this year I’ve gotten 39 comments, 110 likes, and have published 14,398 words. I don’t know whether that counts image captions. But this also leads me to learn what previous year statistics were like; I’ve been averaging over 900 words per post since 2015. In 2015 I averaged about 750 words per post, and got three times as many likes and about twice as many comments per post. I’m sure that doesn’t teach me anything. At the least I won’t learn from it. If all this has convinced you to read my posts, please, keep reading them. You can add them to a WordPress reader by way of the “Follow nebusresearch” sticker on the center-right of the page. Or you can get it delivered by e-mail using the “Follow Blog Via E-Mail” button underneath it. If you’ve got your own RSS reader, you can follow from this feed. There’s probably more ways to follow this, too. And if you want to follow me on Twitter, try @Nebusj, because that’s me and I like having company there. The last full week of 2017 was also a slow one for mathematically-themed comic strips. You can tell by how many bits of marginally relevant stuff I include. In this case, it also includes a couple that just mention the current or the upcoming year. So you’ve been warned. Mac King and Bill King’s Magic in a Minute activity for the 24th is a logic puzzle. I’m not sure there’s deep mathematics to it, but it’s some fun to reason out. John Graziano’s Ripley’s Believe It Or Not for the 24th mentions the bit of recreational group theory that normal people know, the Rubik’s Cube. The group theory comes in from rotations: you can take rows or columns on the cube and turn them, a quarter or a half or a three-quarters turn. Which rows you turn, and which ways you turn them, form a group. So it’s a toy that inspires deep questions. Who wouldn’t like to know in how few moves a cube could be solved? We know there are at least some puzzles that take 18 moves to solve. (You can calculate the number of different cube arrangements there are, and how many arrangements you could make by shuffling a cube around with 17 moves. There’s more possible arrangements than there are ones you can get to in 17 moves; therefore, there must be at least one arrangement that takes 18 moves to solve.) A 2010 computer-assisted proof by Tomas Rokicki, Herbert Kociemba, Morley Davidson, and John Dethridge showed that at most 20 face turns are needed for every possible cube to be solved. I don’t know if there’s been any success figuring out whether 19 or even 18 is necessarily enough. Bill Griffith’s Zippy the Pinhead for the 26th of December, 2017. This is not as strongly a memoir or autobiographical strip as Griffith will sometimes do, which is a shame. Those are always captivating. I have fun reading Zippy the Pinhead and understand why people wouldn’t. But the memoir strips I recommend even to people who don’t care for the usual fare. Bill Griffith’s Zippy the Pinhead for the 26th just mentions algebra as a thing that Griffith can’t really remember, even in one of his frequent nostalgic fugues. I don’t know that Zippy’s line about the fifth dimension is meant to refer to geometry. It might refer to the band, but that would be a bit odd. Yes, I know, Zippy the Pinhead always speaks oddly, but in these nostalgic fugue strips he usually provides some narrative counterpoint. Larry Wright’s Motley Classics for the 26th originally ran in 1986. I mention this because it makes the odd dialogue of getting “a new math program” a touch less odd. I confess I’m not sure what the kid even got. An educational game? Something for numerical computing? The coal-fired, gear-driven version of Mathematica that existed in the 1980s? It’s a mystery, it is. Ryan Pagelow’s Buni for the 27th is really a calendar joke. It seems to qualify as an anthropomorphic numerals joke, though. It’s not a rare sentiment either. Jef Mallett’s Frazz for the 29th is similarly a calendar joke. It does play on 2017 being a prime number, a fact that doesn’t really mean much besides reassuring us that it’s not a leap year. I’m not sure just what’s meant by saying it won’t repeat for another 2017 years, at least that wouldn’t be just as true for (say) 2015 or 2019. But as Frazz points out, we do cling to anything that floats in times like these.